Friday, January 26th Away @ Marian: 7:00p.m. Saturday, January 26th Home @ The Ponds of Brookfield: 7:30 p.m. This weekend marks the third to last weekend of conference series for the NCHL regular season and it is a busy weekend again with six conference teams battling it out in three conference series and two conference teams in non-conference action. 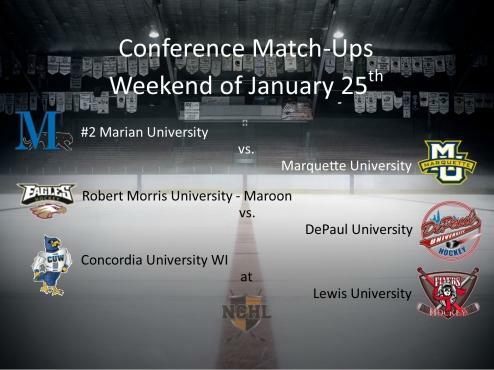 The headliner of the weekend is the matchup of #2 Marian University and Marquette University in Fond du Lac, WI. Marian sits in first place, with a perfect 12-0 record, and needs only four more wins to match #12 Aurora’s perfect conference record last season. Marquette sits two points behind Marian in second place and would like nothing more than to end Marian’s unbeaten steak in conference play, while also giving them a shot at the number one overall seed. Both teams come into this series with momentum, so it should be quite the battle. #2 Marian University hosts Marquette in a clash between the 1st and 2nd place teams in the conference standings. Marquette sits two points behind Marian, but this is their last conference series of the season while Marian still has one remaining. So, Marian still has the inside edge to the number one overall seed and Marquette has to worry about a hard charging #12 Aurora University for the second spot should they not gain at least a series split. Last weekend both teams were in action against non-conference opponents. Marian swept Michigan Tech University and Marquette swept former NCHL member St. Mary’s University of MN in Winona, MN. With two series left, and up to this point a blemishless record, Marian is looking to follow Aurora’s lead from last year and finish off a perfect conference season. Marquette swept Aurora earlier this season, so they are not a team to look past and they as well want one of the coveted first round bye, which a series split will earn them. Also, Marquette comes into this series on a five game conference win streak. During their series last season Marian came away with two victories, winning 10-4 and 7-3. A reversal of those fortunes this year will give Marquette an outside shot at the top seed, but if Marian repeats those results Marquette may be looking at dropping to the 3rd seed.